Buy something | Pen Parentis Literary Salons | Parenting Done. Write. Get a t-shirt for your kids or for yourself–click the link to see our adult-size t-shirts. Support Pen Parentis by purchasing one of our awesome T-shirts! 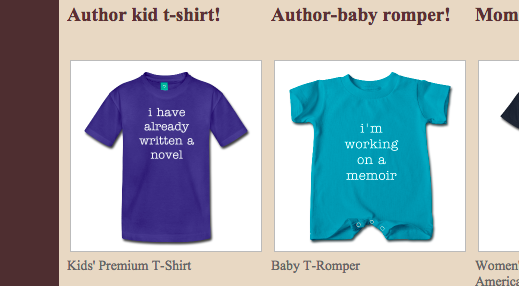 We have shirts for mom, dad, kid, and even baby writers. Have a look (a portion of each purchase will support Pen Parentis operating costs).